You can access the campsite information, or the campsite information and motorhome pitch information on the app by using the unique code on your CampingCard ACSI discount card. Do this before you download the app, and enter your unique code below. 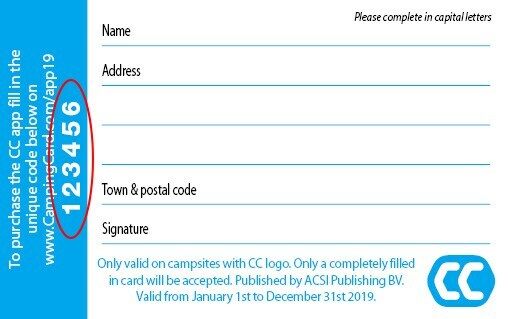 Please note: if you purchased the CampingCard ACSI including app access (the combi or combi subscription), you don't need to order access to the app separately. Download the CampingCard ACSI app in the app store, and log in using your 'My ACSI account'. Use the CampingCard ACSI App to find your perfect campsite or motorhome pitch! Because it's also possible to purchase motorhome pitch information with your campsite information. Finding a great value campsite or motorhome pitch has never been easier. Choose from over 3,600 campsites that accept CampingCard ACSI and over 9,000 motorhome pitches. You can use the app on three devices at once, and because you can also use the app offline, it's perfect for on the road. The handy filters help you to find a place to stay quickly, and you'll receive free updates throughout the year, including changes to campsite information and new campsite reviews. The information in the CampingCard ACSI app is available until 31-12-2019. Above is an example of a code on the CampingCard ACSI discount card. After entering your unique code, you'll be automatically redirected to the order form. You can finalise your order here. Install the CampingCard ACSI app on your mobile, tablet or desktop. Open the app, and log in with your 'My ACSI account'. Download the campsite information or campsite and motorhome pitch information that you want to use. The information is divided into handy country packages. Please note: the CampingCard ACSI app can only be used in combination with a valid, physical CampingCard ACSI discount card.